A confidentiality agreement can be referred to as a legally-binding contract where a business party or an individual officially acknowledges that he/she would not disclose a certain information – that is sensitive for the other party in the agreement. Such agreements could be mutual where both the parties are completely obliged to ensure secrecy- or could be unilateral where one of them has to maintain the obligation. 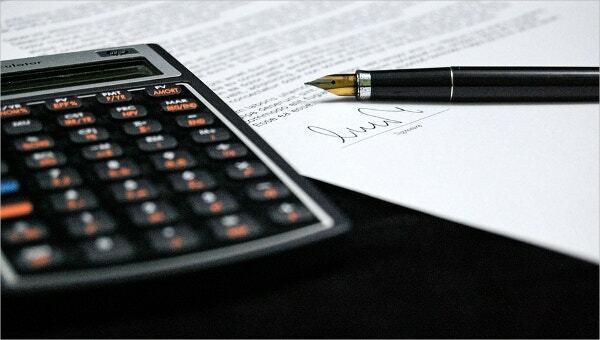 If you need help in drafting these agreements, there are pre-designed confidential agreement templates to go for. 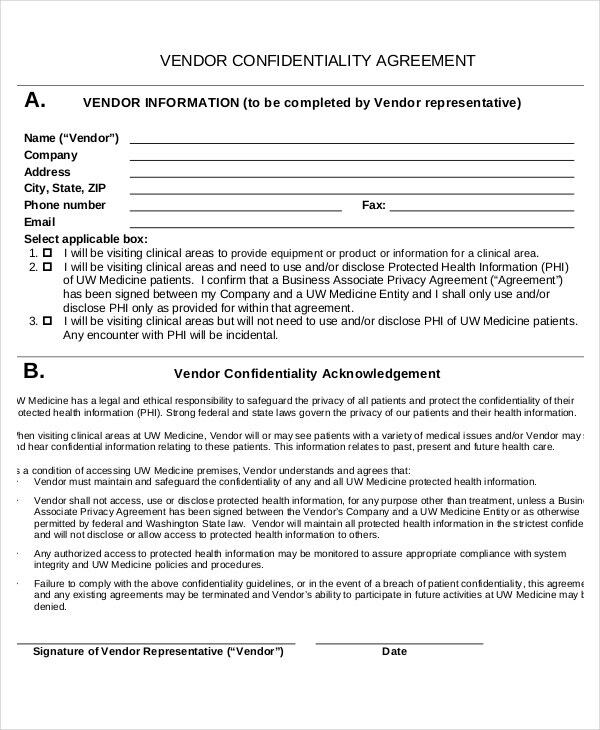 If your clinic needs to sign a confidentiality agreement with a vendor, this confidentiality agreement template would be the thing for you. It comes with vendor’s acceptance of terms and acknowledgement from the clinic. 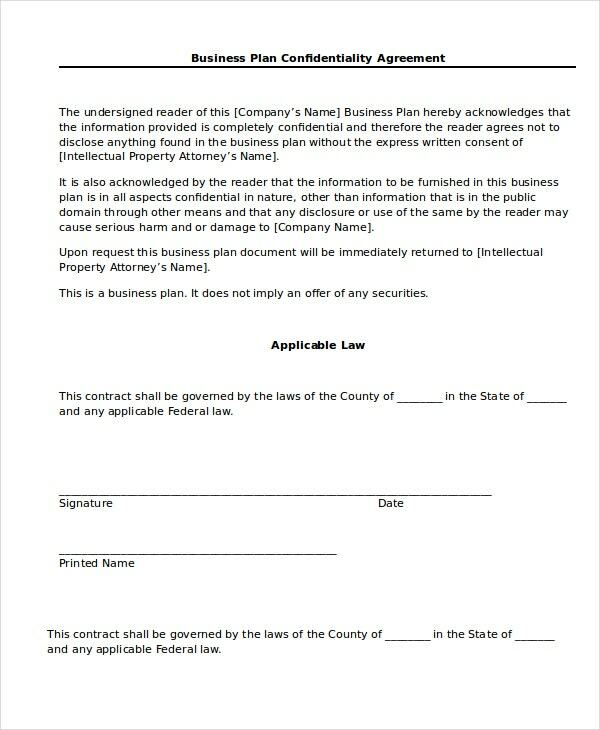 This business confidentiality agreement template starts with the declaration that the reader signing it fully acknowledges his/her responsibility to keep the business information imparted confidential. The name of the attorney under whom the agreement is made, would be mentioned as well. 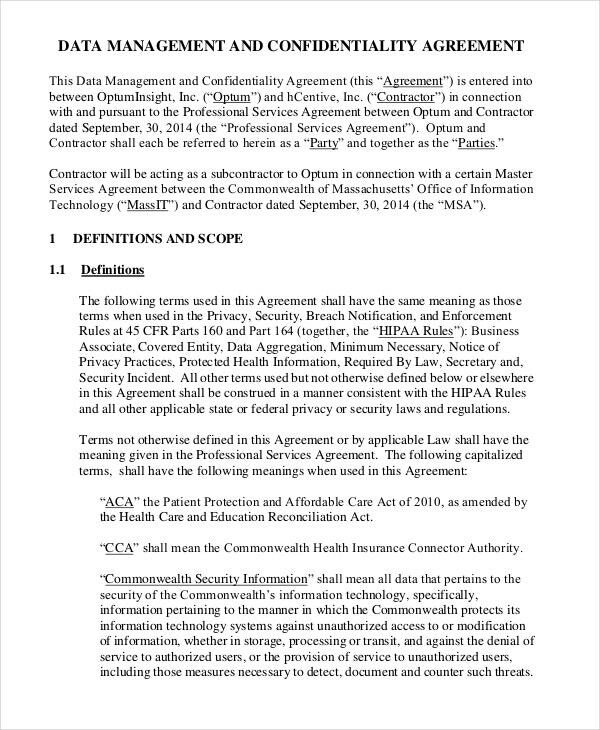 This is a detailed NDA & confidentiality agreement template which begins with the name of two concerning parties and is further followed by a whole set of terms and conditions coming under the Confidentiality Agreement. 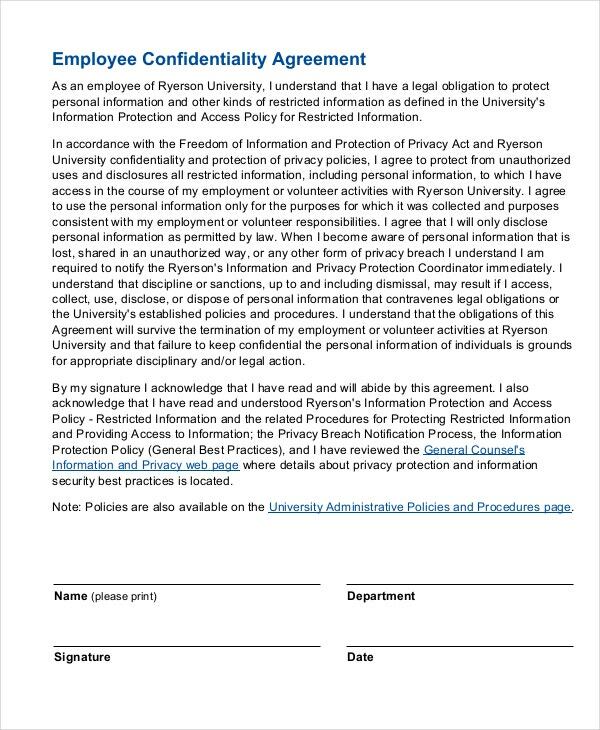 If your university needs to draft an employee confidentiality agreement policy and you need help with the official text and format, this university employee confidential agreement template is the thing that you need. 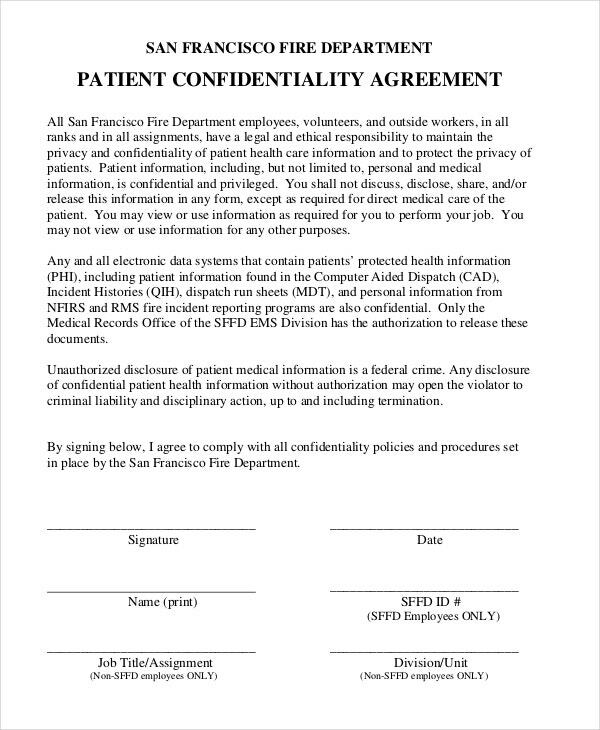 This detailed confidentiality agreement template speaks of a NDA agreement between two parties and includes elaborate data on the pertinent definitions, scope- as well as agreement obligations to be followed by both the parties. > What is the Purpose of Confidentiality Agreement? The main purpose behind a confidentiality agreement is to ensure that a certain trade secret/s stays guarded between the parties entering a contract. 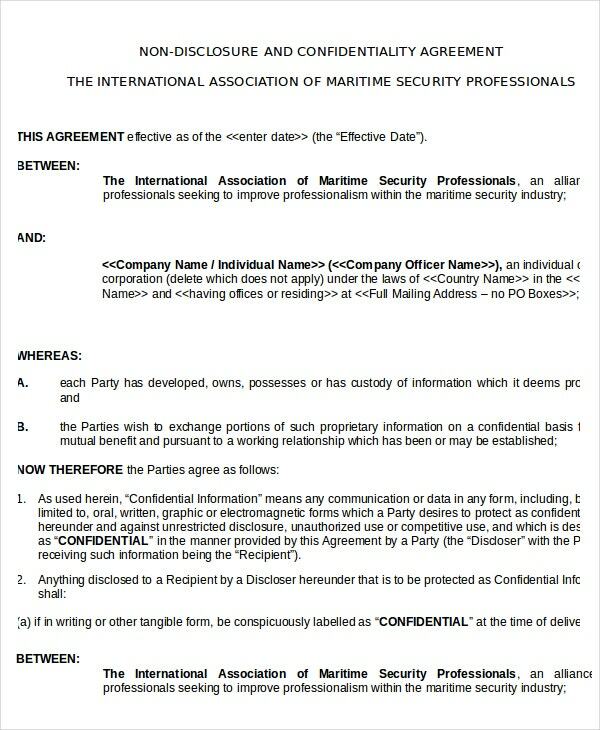 This agreement is a legally binding document that assures that the agreed party cannot disclose the private information without the permission of the other- a breach of the agreement here might mean a lofty penalty. Confidentiality Agreements are really important when you are dealing with sensitive information and have to ensure complete protection for such data. Thus, these contracts help to create as well as maintain a kind of certified confidential relation in between the concerned parties. > Who Needs a Confidentiality Agreement? A confidentiality agreement is an important business contract and is often used by companies, especially while entering crucial deals. However, any organization or individual, who needs to maintain privacy with its sensitive information- will need to prepare and maintain a confidentiality agreement. 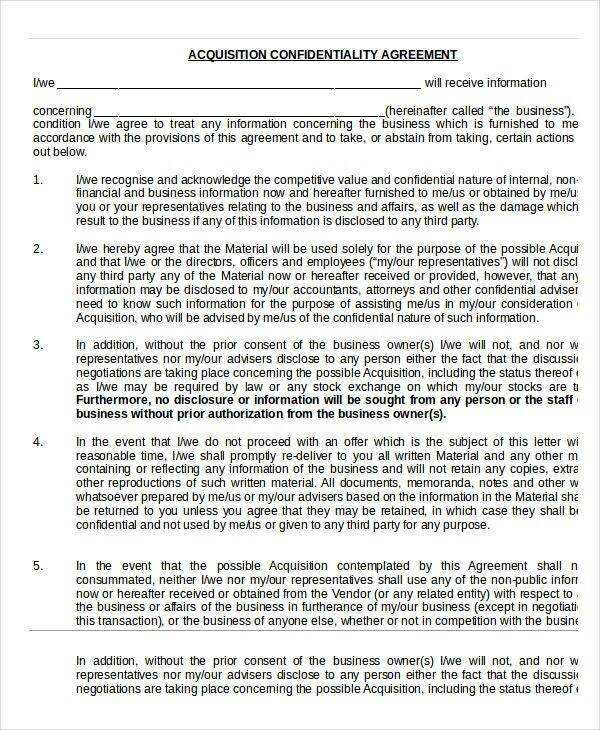 It could be agreement with the employees or agreement with a business group. 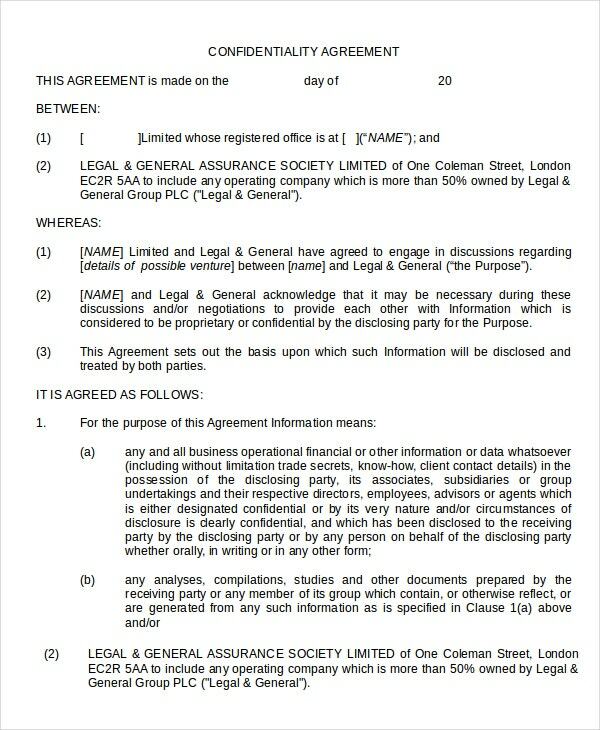 Apart from business houses, the confidentiality agreements are used by universities, hospitals, clinics and so on. 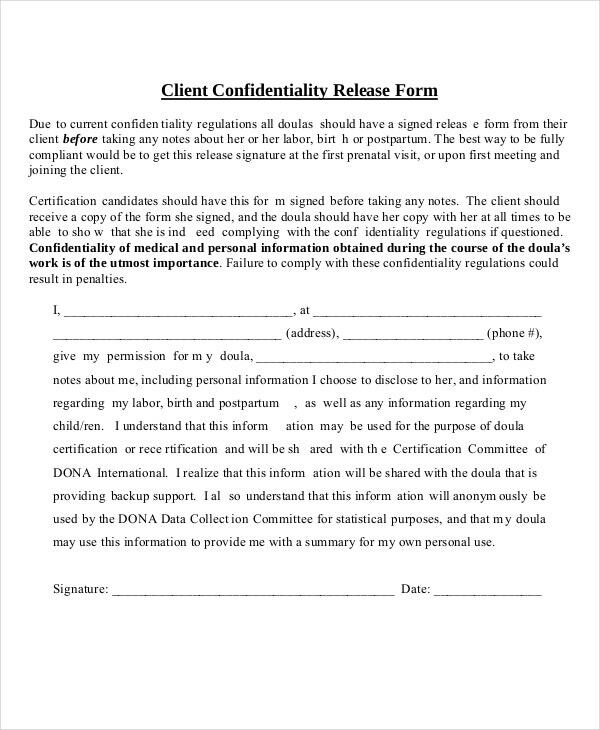 At times, personal confidentiality agreements are also created when somebody has to protect personal information disclosed to another person, a close one mostly and has to protect it from the outside world. > What is the Benefit of Confidentiality Agreement? When you are running a business, you have to ensure complete protection of your trade secrets and customer data. But then, you can’t keep all the information just to you and at times, you might have to share some of it with your employees or business parties you are entering into major deals with. In such cases, there is always the tension of having the information leaked and a confidentiality agreement comes as a handy lifesaver here. The main benefit of such an agreement is that it makes it official that the other party cannot legally disclose a specified set of information as directed by you. Such agreements also mention the consequences of breaching the agreement terms. A non disclosure agreement is your much needed aide when you are afraid of getting your private information leaked while sharing it with your staff or some client. The confidential agreement templates mentioned above are all drafted by experts and hence you will get the most appropriate format of designing such agreements for your organization.